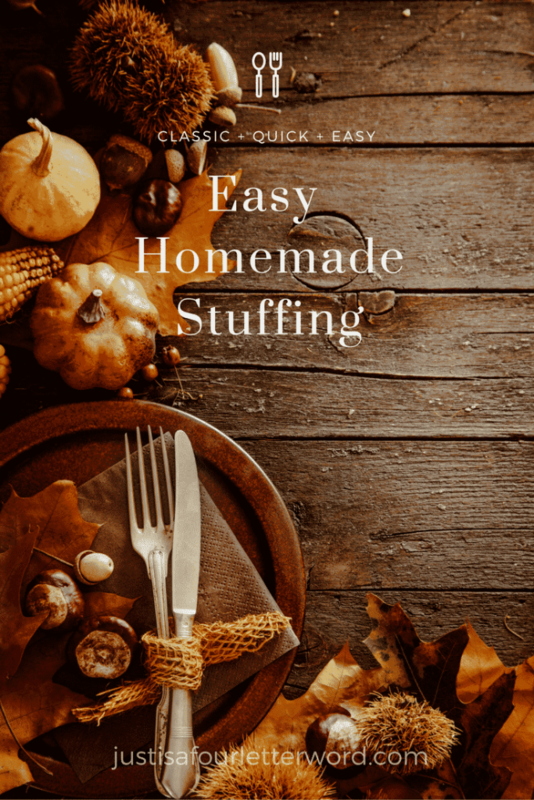 Our traditional homemade stuffing recipe is easy & comforting. Cook inside turkey for a delicious side dish for Thanksgiving or Christmas. Make it ahead the night before to make prep easy! I love homemade stuffing. In fact, I was raised on it. And I’ll be honest. I’m not that picky. Stove Top is great. Homemade stuffing is great. Give me more stuffing. Fork it over, as they say. So this post truly comes from the heart. Making my own turkey stuffing had me a little nervous at first but now it’s one of my favorite Thanksgiving sides to make. You see, I never actually made my mom’s homemade stuffing until recently, when I cooked my very first turkey. I was totally overwhelmed and almost caved, but my family threatened encouraged me to make the real thing. So I did! And you can too. 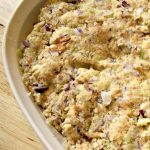 This easy stuffing recipe was seriously the easiest part of my Thanksgiving dinner meal prep. My blog posts include affiliate links, which means I may earn money on purchases made. Tradition is important to me, especially during the holidays. I do love trying new recipes and making fun little Thanksgiving treats with my kids. But when it comes to the big meal, I’m all about the comfort food. There are probably a million different ways to make homemade stuffing, but today I decided to share our family recipe (with permission from my Mama). Thanks Mama! Classic, traditional stuffing cooked inside the turkey is so easy and simple. You’ll wonder why you ever made it any other way. The holidays are a time for nostalgia and I have no shame in admitting the fact that some of my best memories are directly related to food. As I type, I can almost smell this delicious homemade stuffing warm and fresh from the oven. Yes, it’s that good! And really, if you’re going to the trouble of roasting your own turkey, you might as well stuff it! Should that be on an apron? I kinda feel like that should be on an apron. Of course you CAN bake this stuffing recipe in a casserole dish and it’s still good. But nothing beats the flavor after roasting in the turkey. I love that you can make our stuffing recipe ahead of time because the holidays are busy enough. I’m down with any way I can cut down on cooking Thanksgiving or Christmas morning. This stuffing is so easy to make ahead because it’s really just a bunch of chopping when all is said and done. Prepare your ingredients the night before and once your stuffing is mixed together, cover it and put it in the fridge. Then, when it’s time to cook your turkey, just add your pre-made stuffing and you’re ready to roast. Then you’ll have plenty of time to do things like make these fun Thanksgiving crafts for kids. My favorite is the thankful tree! Everyone can do it. Some people prefer casserole style stuffing. My family tradition has always been to actually stuff the turkey, so that’s how I make it. Letting the stuffing cook inside the turkey is so easy and simple, I really can’t imaging making it any other way. When you cook your stuffing inside the turkey, you eliminate the need for broth in the recipe because the turkey does all the work. You can still scoop it out an serve the stuffing in a pretty dish at the table if you want to. It’s a win all around. For more recipes, check out Holiday Recipes: Quick Easy Recipes for the Holidays . 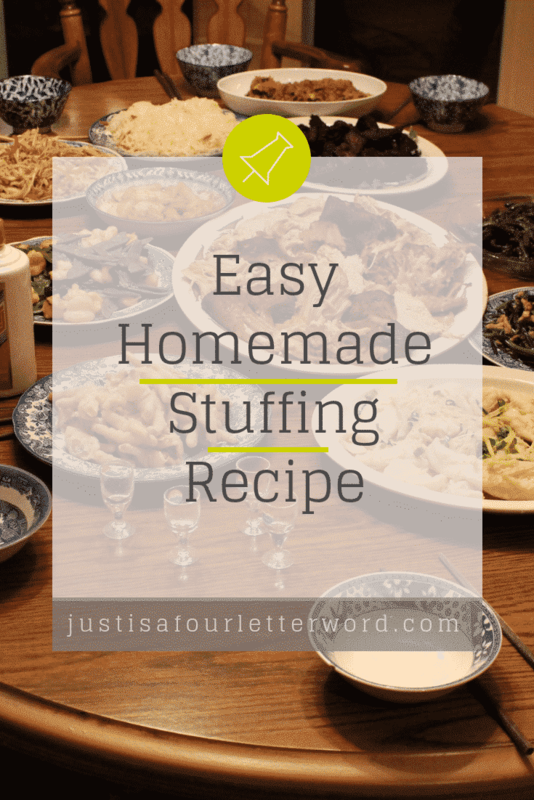 My family stuffing recipe is easy and so comforting at the holidays. We cook ours with the turkey and it's delicious! 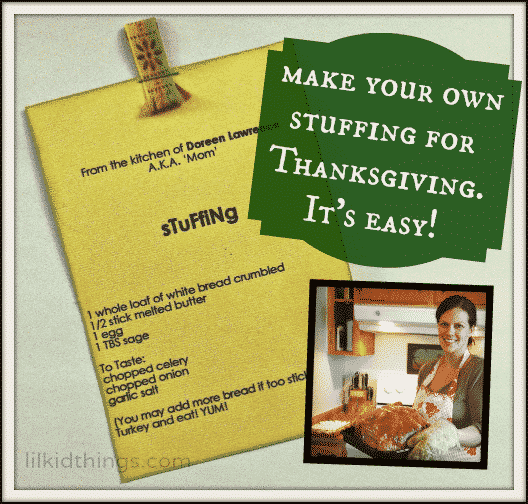 Make this easy stuffing recipe for Thanksgiving or Christmas or any other time you feel like stuffing a turkey! Make ahead the night before so you'll be ready to go in the morning. Chop veggies and add to the bread mixture. I use about a cup each but you can adjust to taste. Mix all ingredients together in a large bowl. I've found that using my hands is faster and more effective than a spoon but it is messy. Stuff mixture into your raw turkey and cook as you normally would. …and if too dry just add a few drops of milk..
You know Sean insists on Stove Top stuffing every year. It’s embarrassing. I totally get it! Stove Top is really good. But there’s just something about home made on turkey day. This looks so good. I’m going to share it in my FB recipe group because I think it could work for some peeps in there!! !